Here is a very depressing experience: sitting in a damp boat in mid-winter, with a gale blowing, it’s getting dark, it’s raining hard and the deck-head lining has been removed to see if we can find where the water is coming through. I found it by Googling ‘heating for yachts’. This was the wrong topic to search on. It should have been ‘ventilation in boats’, but I only know that now because I’ve read the book. So, is it to be A Cold, Damp Boat or A Warm,Dry Boat? As you can tell, I highly recommend “A Warm, Dry Boat” by Roger McAfee. It took a little while to cross te Atlantic, but it has been well worth it. 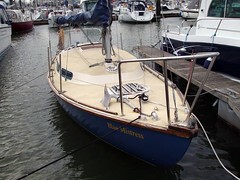 The refit was planned because various deck fittings were leaking and needed reseating. It was decided, because of the age of the boat and the distances that we might sail in her, it would be better to do the job properly and not skimp it. I now know that merely replacing fittings is not enough to solve the problem. Moisture will still build up in the air inside this now water-tight (as far as possible) hull – moisture from body heat, moisture from any water in the bilges, moisture from damp clothing, mositure from the air – moisture that then condenses into droplets on cold surfaces and starts the process all over again. If all that is done to alleviate this is to add a heater to give warmth, the first thing that will happen is that more moisture will be absorbed into the air, the greater will be the difference in temperature between the outside of the boat and the inside and the more condensation will occur. (How much moisture will depend on the heating system). This problem can be greatly reduced by moving the air that is high in moisture out of the boat and replacing it with fresh air, i.e. it is movement of air we are looking for. In other words, a boat needs to breathe. So we have to find ways of moving air, and, initially, because of the size of the boat, we will try to do this passively. The fore hatch, which previously (as in the image above) hinged with the leading edge opening forward, is being refitted with the hinges forward. Two reasons: a) It is safer – an unlocked hatch cover facing forward on the foredeck can scoop water into the boat at an alarming rate. b) On the mooring, with the hatch propped open (the exact opening will depend on wind strength), the flow of wind from forward lifting over the hatch should create a potential vacuum at the opening, dragging air out of the forecabin. This should create a flow of air from the main cabin forward. By controlling the air into the boat from further aft, the movement can be maintained and the air exchanged. In Blue Mistress, the companionway is fairly small, so we are dividing the drop boards into two so that the air intake through the companionway can be controlled by varying the combination of drop boards and the position of the sliding hatch. Also, a large fuel tank that occupied the starboard quarter berths has been removed and both quarter berths are now open. There are further plans for these for next year, but, in the meantime, two small hatches in the sides of the cockpit aft can be opened and, with the companionway shut, air can now flow the full length of the boat. It is also possible to have a spare drop board with a fan fitted to it (perhaps run by a solar panel). 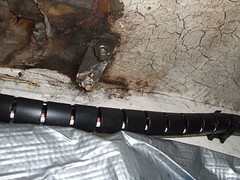 During the winter, this could be installed with a hose led to the bilge so that the air is ventilated directly from the dampest part of the boat, rather than allowing this moisture to flow into the cabin first. That’s the theory. Now we need to get the boat back in the water to see whether the plan works. More of this later. I agree, nothing is more depressing than arriving at your boat and finding it dripping with condensation inside. I’ve installed a solar powered fan that fits in a Tannoy ventilator. I’ve also attempted to keep the bilge as dry as possible. Hopefully this will improve things. My friend on Orkut shared this link with me and I’m not dissapointed that I came to your blog. Having asked the same question “How to heat my little 26 footer?”on the YBW fourm I was directed to this. Hi Bill by the way! Reading your comments, the previous owner of my folksong has installed 2 ventilation systems. One is a mushroom/fan gubbins the other is a classic right angled jobbie with mushroom inside (sorry do not know the terminology!) which is positioned above the cooker where the ceiling is lined with stainless steel for heat protection! The boat has a 2” thick lining of insulation everywhere but for the very forward part of the interior floor where it is lined with thin insulation and a thick bitumen backed course plastic carpet. I have one leak around the step going into the cockpit which needs addressing with new sealant – fingers crossed! I am going to buy a little £25 portable gas heater for short blasts to keep the chill off next winter. Bill I was offered a mooring in Itchenor Chichester this year so she is going in and will stay in over next winter also to keep the costs down mainly but also to have a few crisp sunny days out. Argh gas heaters! For ever pint of LPG that is burned you will get over a pint and a half of water produced. This is going to condense somewhere. There was a firm called Carver that made gas heaters for caravans. The flame was in a kind of box and the flue gas went outside. The box was a heat exchanger so that the only thing coming into the caravan was warm air. If you rig it so that fresh warm air is blown in, the moist air can be vented away. OK some heat will be lost. If one has shore power one can cook electric as this way less moisture is produced. I just bought a freeman 22 mk1….there was water in the bilge, a soaked carpet throughout, water stains on the carpet lining under windows…I thought the window rubbers had perished, but water collects on the underside of the walkways, (inside), but not just below the windows, which suggests condensation, which, unless cured, will continue to soak the carpet….there is just one vent for the whole boat, in the main cabin, where the cooker is…any suggestions ?…. genres, from racing and action to the logic and playing apk video games.